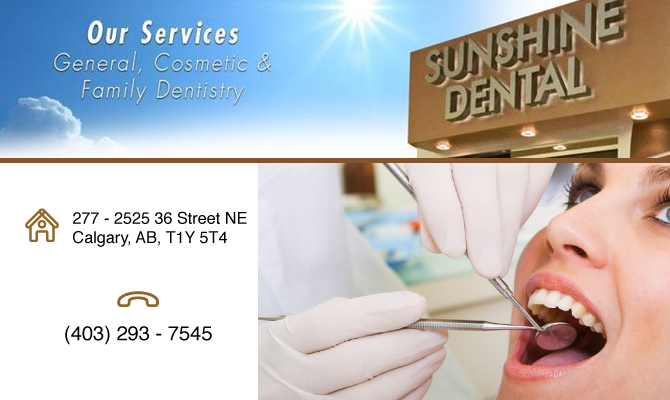 Sunshine Dental Centre offers a complete range of general, cosmetic and family dentistry services to patients of all ages. We are proud to also have the skills, knowledge and expertise necessary to provide Invisalign services so that you can enjoy straight, beautiful teeth without the pain and embarrassment associated with traditional braces. We are committed to helping you achieve the healthiest, most beautiful smile possible so that you can enjoy optimal oral health. We understand that a trip to the dentist can instill fear and anxiety in patients of all ages. That is why we go out of our way to ensure that our patients feel calm, comfortable and at ease both before and during their appointment. From our friendly Calgary dental staff to our gentle approach, we take measures to ensure that you get the dental services you need, regardless of your anxiety level. In fact, for any patients dealing with extreme anxiety, we can even offer safe Calgary sedation dentistry so that you can experience a state of sleep while we pursue the services you need. In order to enjoy healthy teeth for life, it is important to visit a Calgary dentist at least twice per year. You must also maintain good oral health from home. During your appointment, we will give you personalized information on what you can do to best care for your teeth at home.